I’m positive that I took American history during my school years. But for some reason, nothing (or very little) seemed to stick. I can remember my childhood friend Gordy Carlson’s phone number (598-2426…it was even before 10 digit dialing!) but can’t remember when the war of 1812 was! Just kidding. But its almost that bad. I’m ashamed at how little I know. 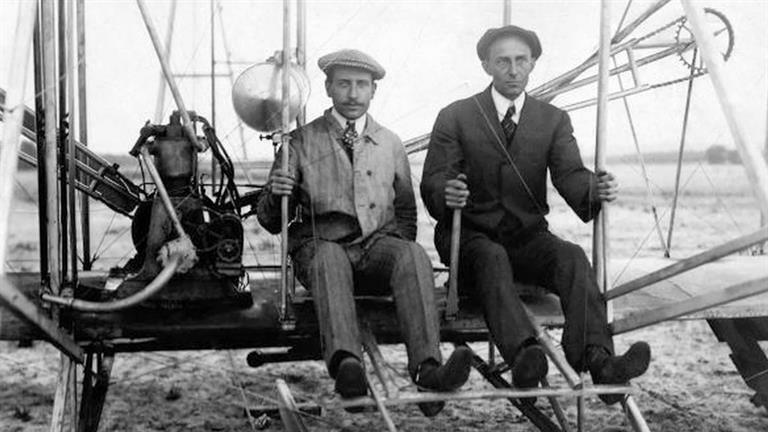 But I think this old dog IS learning some new tricks about history and its filling me with lots of questions and desires to learn even more! I hope this adventure is having the same effect on the kids. Perhaps when they are learning American history in the classroom they will already have a solid foundation and they can capitalize on the opportunity to dig deeper to where their questions lead them. All that to say, I had no clue that there was a group of English settlers who came to America well before the Pilgrims I learned about in school. 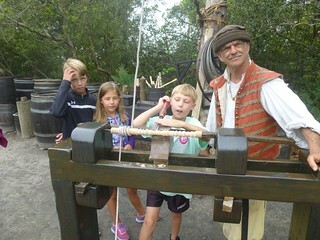 It was 1587 and they settled on Roanoke Island just a short drive from our campground. 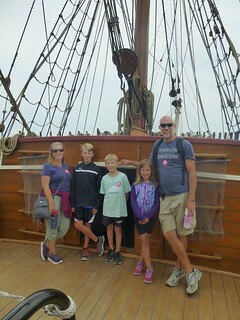 So we packed a lunch and drove out to the Roanoke Island Festival Park. We had to say goodbye to Ocracoke as we moved on northward. We arrived at the ferry terminal just as one ferry was leaving which gave us an almost assured spot on the next one. 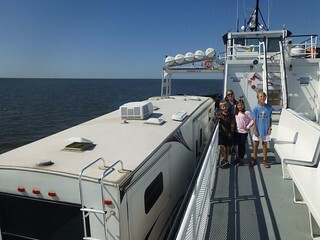 This ferry will take us to Hatteras, does not take reservations and is free! While we waited for the ferry we did a little more beach combing where we found a dead puffer fish (we think) and a dead jelly fish (we think). We boarded the ferry and set sail. I took my computer into the passenger lounge to do some work while the rest of the fam stayed in the vehicle and….uh, I don’t know what they did. 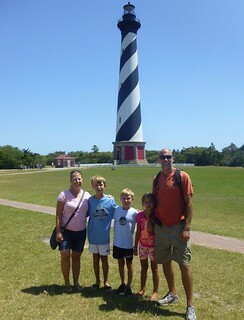 We arrived at the Hatteras ferry terminal and made a beeline to the famous Hatteras lighthouse. We had heard great things about the Outter Banks of North Carolina and so this was on our must see list. Ocracoke was the low key gem that many suggested and the target of our next visit. Little did I know that I shared a special bond with this island that goes back almost 20 years. But first, we must take to the seas to get to this barrier island and for this we have to load Ava and the Beast onto another ferry. This one, unlike the others we’ve ridden, costs some cash and reservations were recommended. The ferry was at 10:00am and they asked that you arrive at least 30 minutes prior to that. We had a 2 hour drive so to give us a little margin I wanted to leave the campground at….WHAT??? What time did you say?? 7:00?? In the morning?? Yeah…this is early for us but I am proud to say that we were rolling at 7:15…not too shabby. We loaded onto the ferry and sailed away. A year or so ago I came across a PBS show called A Chef’s Life and found myself enjoying it quite a bit. I liked the story, I like the farm to table concept and I like Chef Vivian’s involvement with the community. Kinston NC sounded like a pleasant place to live. Totally unrelated I was reading a blog from a full time traveling family (honestly don’t remember which) and saw that they stayed in Kinston, NC. I put two and two together, added twelve and carried the five and realized that maybe we could stop through Kinston during our trip! We had a busy earth day!! (Yes it was a couple days ago but the festivities were today). 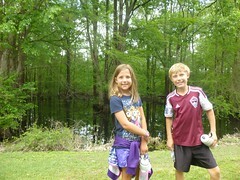 A local club had a kids fishing day at the pond next to us. 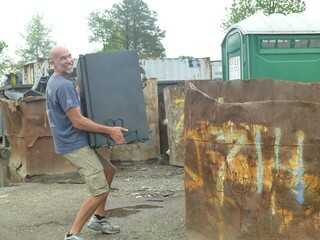 I was left holding the worms, so I decided to go pick up trash (sadly there was a LOT). 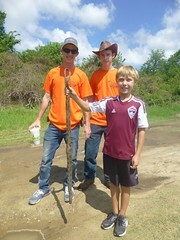 – Dacen held a dead water moccasin/cotton mouth. Luckily I’m not afraid of snakes because that boy is a little obsessed. We learned a lot about snakes from the teens who killed it. We later found out even though the snake DID have the diamond shaped head and other appropriate markings, it was another very similar looking snake. So, Dacen STILL wants to hold a cotton mouth. Sigh. 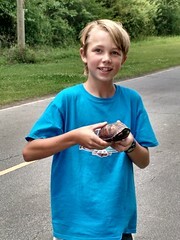 – Caden rescued a turtle who was trying to cross the road. There’s a joke there I’m sure! – Brielle rescued an injured or stunned toad. Sadly it was camera shy and hopped out of her hands before we could take the picture. So far North Carolina is very different from South Carolina. I think its dryer and treeier (trē-ē-ur) but I don’t know. At the place we’re staying there’s a bird that can sing happy birthday, flying squirrels, a mouth and heart, and a cool playground! All that and full hookups is only fifteen bucks a night! 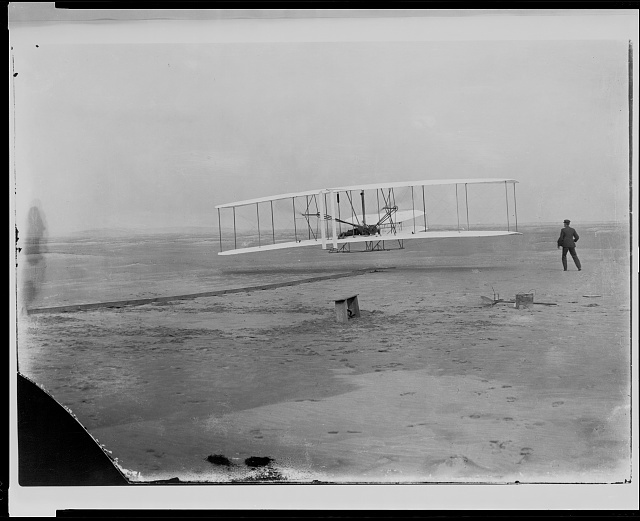 We hung…no hang…no hanged…no- well we saw the Staats and it was fun to play with them. Mrs. Staats made a good dinner and we drove in a go cart with no brakes that we nearly wrecked (really Dacen nearly wrecked it. I almost nearly wrecked it too but I stayed cool-headed enough to slow it down too and no one even thought I was out of control and if I go on I’ll be gloating). We got to go to a chocolate factory with Calvin and Melody Deutchbein which was awesome. We got to see how chocolate is made and we even got to try some chocolate for free! I thought we’d only get samples but Mom and Papa got us normal dark chocolate and even liquid chocolate. Hmmm typing… cheese… knees cheese… cheesy peasy kneesies… why am I still typing!!!??? Date night! The Chef and the Farmer restaurant is less than a mile from the campground so we had no reservations about leaving the kids at home while Steph and I went on a date! We DID, however, have reservations at the restaurant for 8:30. 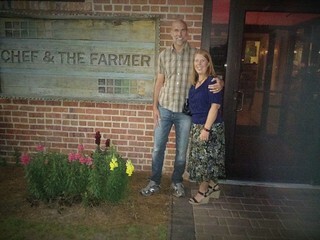 We showed up a little early and found a local to snap a picture of us by the sign.